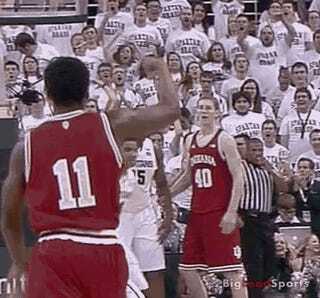 Did Derrick Nix Smack Cody Zeller In The Nuts, Or Did Zeller Make Him Do It? Senior Derrick Nix is Michigan State's team captain, but he's done some pretty uncaptain-like things. Like an offseason arrest for impaired driving and marijuana possession (the latter charge was dropped.) Like offering up bulletin board material when he called Victor Oladipo overrated. And then, toward the end of last night's thrilling, bizarre Indiana win in East Lansing, appearing to balltap Cody Zeller. Look at Cody's right hand and it's obvious that he pulled Nix' hand into him (how else would his hand, on the opposite side of Nix' arm, move with Nix' arm without delay or separation?). Plus he reacts simultaneously (there is a slight delay if you really get hit, unless you see it coming) and Nix would have reacted differently if he was trying to get away with something. You're welcome to pore over the video frame by frame, but it looks like some combination of Zeller trying to free his arm/Nix trying to free his arm/Zeller pulling Nix towards him/Nix slapping his hand outward to get Zeller off him. So there. There's a decent chance these teams meet for a third time in the Big Ten Tournament. Fans of both schools, and literally no one else on earth, are eager to spend the next few weeks getting to the bottom of Nutgate. Stay tuned.